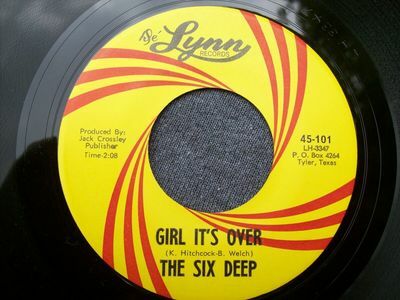 Six Deep--Girl It's Over / I Must go--De' Lynn 101. Excellent 1967 Texas garage punker from Beaumont on a small independent label. Vinyl is VG+ with good gloss, just some scattered light marks. Labels are clean.